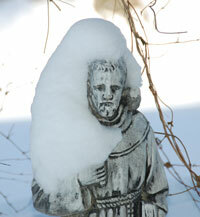 Cindy took a picture of our St. Francis statue after last week’s snow storm. That’s the image I use for my Twitter account. We did have a snowy week and were supposed to get more last night and today. We even went to Saturday evening Mass last night thinking we may not have been able to go this morning. However, Msgr. Higley, prayed that the snow would miss us and he was answered. At least we haven’t received what we expected. Just a light dusting so far.